FromScratch, the autosaving note taking app I released a couple of months ago, just got its first update. The two mayor new features are note folding and an update notifier. FromScratch 1.0 got a great reception, with over 14K downloads, something I’m really proud of. Apparently I’m not the only one that was in need of a really simple but really useful note taking application. You can download FromScratch 1.1.0 from the site Fromscratch.rocks or the Github releases page. Even before releasing FromScratch, I was thinking about a way to support different contexts. My daily notes (mostly work related) can live comfortably inside FromScratch, but also adding my personal notes, which are often more long-term, leads to cluttering and I lose overview. I wanted the ability to manage all my notes in FromScratch, but I was not willing to trade a lot of extra complexity for it. 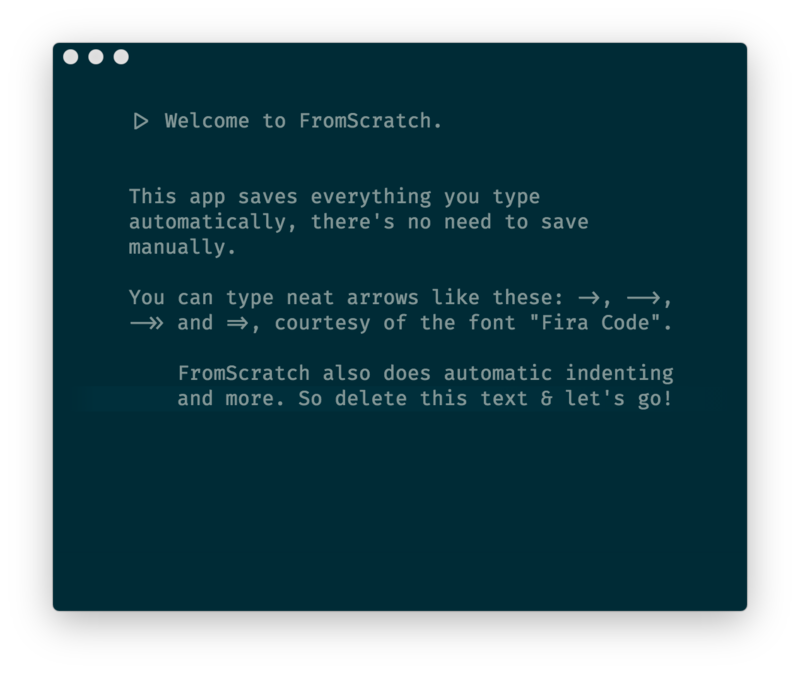 After all, FromScratch’s strength lies in its simplicity. Other people had this problem too, and an issue was opened on Github. After gathering feedback I compiled a list of options and, recalling how I write code when large parts of the file are not immediately useful, gravitated towards the solution in text editors: code-folding. I experimented with an implementation of it for a couple of weeks and was quickly hooked. FromScratch needed something like code folding. But for notes. Note folding! Importantly though, you won’t be confronted with the note-folding UI if you don’t want to, it’s a completely optional part of FromScratch that will only be visible when interacting with it. As the amount of text in my personal FromScratch grew, I began to notice a problem: I had no clear view of where I was in my notes. This had two reasons: There was no indicator of the length of your notes and where you were in them. So I added two things to remedy that: A scroll bar, and a highlight behind the current row. Both are deliberately subdued, so they don’t take up too much visual space. On macOS, the titlebar is now also hidden so more of the focus is on the text. Updates was not something I initially cared about, but I wish I had. It’s a little ironic to now have an update of an app that includes an update notifier. There’s no way of telling everyone that is currently running the app to update! Regardless, I now have a generic mechanism with which I can trigger an “There’s an update available!” message inside FromScratch when I bump the version on the website, so from this update on, we’re good. The next version will probably be a while away as I want to focus on other things for a bit (unless everyone starts contributing code on Github!) but I plan to add searching, theming and better/nicer ways to work with lists to it. 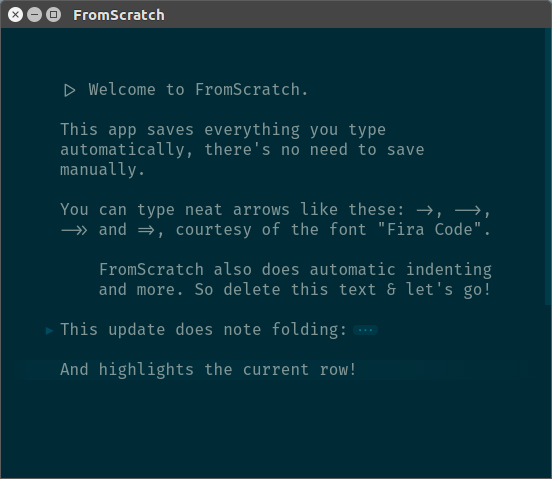 FromScratch 1.1.0 is a free download, and you can get it now from the site Fromscratch.rocks. There was a small bug with the positioning of the update notifier when you zoomed out, so we’re actually on 1.1.1 now! If you’ve already downloaded 1.1.0 you’ll get an update notifier shortly.